A grilled Chicken Breast on a toasted bun served with Potato Fries. A grilled Chicken Breast served with fresh Vegetables and Spanish Rice. 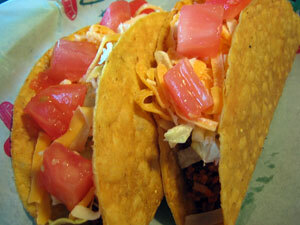 A small Flour Tortilla with seasoned Ground Beef, Cheese, Lettuce and diced Tomato. Served with Spanish Rice and Sour Cream. Your choice of seasoned Ground Beef, Shredded Beef, Chicken or BBQ Pulled Pork in a crisp Corn shell with Lettuce, Tomatoes and Cheese. Your choice of seasoned Ground Beef, Shredded Beef, Chicken or BBQ Pulled Pork wrapped in a 6” flour tortilla with Lettuce, Tomato and Cheese. Mixed Greens and Shredded Carrots with a Dressing of your choice served on the side. Deep fried Chicken Tenders and Potato Fries. An All-Beef Hot Dog served with Sam’s Potato Fries. A grilled quarter pound Hamburger served with Potato Fries. Billy’s Burger smothered with melted Cheddar Cheese and served with Potato Fries. Just like Mom makes, in a creamy Cheddar sauce! Mild and simple! A fried Flour tortilla topped with melted Monterey Jack and Cheddar cheese. Take two flour tortillas, stick ‘em together with melted Monterey Jack and Cheddar cheese and you have a Grilled Cheese without the “grill”. A crisp fried 6” Flour Tortilla topped with seasoned Tomato Sauce and melted Cheeses. Crunchy deep fried cheese sticks served with warm marinara sauce for dipping. A quarter pound of BBQ Baby Back Ribs served with Potato Fries.